4 Bedroom Detached House For Sale in Crowborough for £875,000. 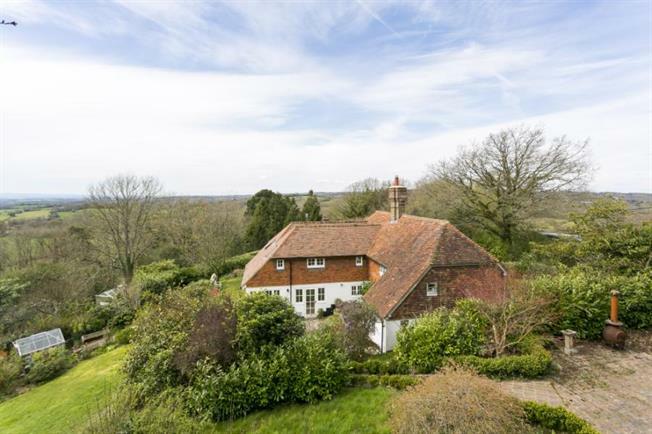 Freeman Forman are delighted to present this beautifully presented, chocolate box Sussex cottage nestled in the most peaceful of locations just outside of the desirable village of Rotherfield, with the most breathtaking of views. Poets Cottage has been extended by the current owners to create an incredible family hub, in the form of a large and bright Kitchen/diner; positioned on the south side of the property light floods in all day. On the ground floor a large entrance hall, separate dining room, lounge with feature inglenook fireplace, downstairs w.c and utility room complete the package for a family home to be enjoyed. Stairs rise to the first floor where four double bedrooms are offered, with period features throughout you really have the feel of countryside life throughout - with breathtaking views in every direction that go on for miles. The master is offered with a tastefully decorated en-suite bathroom. The property is situated in a plot of roughly an acre of garden, with plenty of space for the whole family to enjoy. Most is laid to lawn, with a private sun terrace tucked away with the most breathtaking views across the weald. A large summer house is also available to enjoy. The cottage is approached via a private driveway off an incredibly quiet country lane. Poets cottage is positioned beautifully on a quiet country lane in rural Rotherfield surrounded by fields and farmland. A highly sought after location within reach of both Rotherfield and Mayfield picturesque Sussex villages. Royal Tunbridge Wells is approximately 8 miles from poets cottage; offering theatres, shops, The Pantiles for dining and grammar schools.